The Lakers did it all. 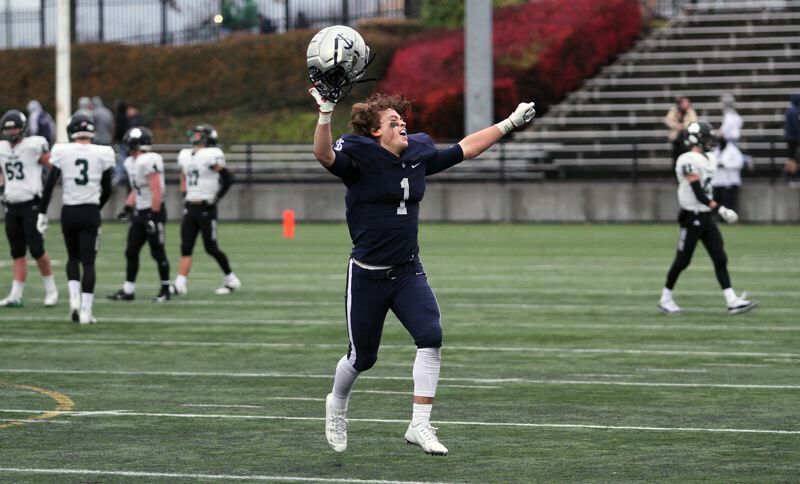 Every challenge, every hurdle, every bump in the road — the Lake Oswego football team overcame them all — not to mention talented Sheldon, beating the Irish 34-27 in a thrilling Class 6A state championship game at Hillsboro Stadium on Saturday. The win marked the second state football championship in Lake Oswego history — joining the Lakers' 2011 team (a 47-14 winner over Sheldon at Jeld-Wen Field in Portland) — and its fourth championship-game battle against the Irish (Sheldon won 31-24 in 2002 and 13-6 in 2012). Lake Oswego's win — capped when junior lineman Cody Carlson recovered a Sheldon fumble late in the fourth quarter and senior quarterback Jackson Laurent took a knee one play later to kill the final 10 seconds on the clock — set off a huge and emotional celebration by the Lakers. "I was just struck with a wave of emotion," said Lake Oswego junior running back Casey Filkins, who finished with 167 yards in total offense and scored all five of his team's touchdowns. "It all hit me — these past 14 weeks just hit me in the face. It's over now, but it ended in the best way possible." "I just started crying with some of my guys (when the game ended)," said Laurent, who completed 14 of 23 passes for 220 yards and one touchdown. "I just couldn't contain it. I couldn't hold it in. Everybody that I've worked with since the summer, everybody I worked with for the past four years, it paid off. It's the best feeling in the world." "It was just insane," added Carlson. "I was just trying to be with my teammates and celebrate. This is an amazing feeling." With the win, No. 1 Lake Oswego capped its season with a 10-game winning streak, a Three Rivers League championship, a 13-1 overall record and its first state title since 2011. For Sheldon, the Southwest Conference champion saw its seven-game winning streak snapped and finished its year at 11-3. As exhilarating as the final result was for Lake Oswego, the Lakers had to work — and work hard — to get past the Irish. Lake Oswego took a 7-3 lead late in the first quarter on Filkins' first TD (a 3-yarder out of the Wildcat formation) and boosted its lead to 13-3 midway through the second quarter on his second score (another 3-yard blast from the Wildcat). Sheldon's first touchdown came on a 47-yard Matthew Burgess burst up the middle that he cut to the left and raced home to score with three minutes left in the half, but the Lakers hardly blinked. They came back with a 61-yard TD drive that took just 2:07 off the clock and ended when Filkins caught a quick-hitter over the left side from Laurent that he broke for a 40-yard score and a 20-10 lead at the half. But the Irish rallied big-time in the second half, getting short touchdown runs by senior quarterback Michael Johnson Jr. in both the third and fourth quarters — sandwiched around another Filkins score (a 13-yard footrace to the left pylon) — then added a 40-yard Jay Kartub field goal that bounced off the crossbar, up into the air and over to give Sheldon a 27-26 lead with 5 minutes, 56 seconds left in the game. The Lakers, trailing for the first time since late in the opening quarter, answered with a championship-caliber drive to secure their 2018 state championship. Taking over at its own 25-yard line with 5:47 left to play, Lake Oswego went to its bread-and-butter — Filkins and the Lakers' talented offensive line of senior tackle Tanner Hall, senior guard Ryan Bertelsen, senior center Mo Linver, Carlson and senior Asher Corbett at guard, junior right tackle Tiger Shanks, and junior Marshall McGuire and senior George O'Brien at tight end. Filkins went up the middle for 7 yards, went inside again and cut right for another 9, then — after a 5-yard Sheldon penalty — went inside for 6 more to reach the Irish 48-yard line. Laurent then threw down the left seam to a wide-open McGuire for a 23-yard pickup to the Sheldon 25. From there, Filkins went up the middle for 20 yards to the Irish 5, went up the middle again out of the Wildcat formation to the 1, and scored again on the next play, another inside run from the Wildcat with 2:38 left on the clock. Already ahead by five points, the Lakers dug the dagger in even deeper on the two-point conversion play, with Laurent throwing a dart over the right side to Filkins, who caught the ball right at the goal line to extend their team's lead to 34-27. "There's always nerves, but that's kind of our program's state of mind — when momentum changes, we've just got to come down and do what we were taught," said Lake Oswego senior linebacker Bryson Breeze. "The offense has won us many games like that — game-winning drives — they are awesome." "There's always a bunch of emotions that run through your mind when it doesn't go your way, but we had the state of mind that we had to come back out and we did it," Bertelsen said. After Aaron Rudder's kickoff for Lake Oswego, Sheldon still had 83 yards between it and a tie ballgame, but still had 2:31 left on the clock and still had Johnson — a Penn State commit who finished with 78 yards and two TDs on the ground and another 114 yards through the air. Lake Oswego senior Chris Todd tried to crush the Irish's last chance when he sacked Johnson for a 14-yard loss on first down, and LO senior lineman Mario Pronnarongvat followed suit when Johnson passed to Burgess on the right side and Pronnarongvat dropped him for a 1-yard loss at the Sheldon 2. But there, facing third-and-25, Johnson threw long down the right sideline and connected with senior tight end Patrick Herbert for a 43-yard pickup to the Irish 45. Three plays later, with Johnson on the run to his left and McGuire hot on his heels, the Sheldon quarterback lofted a wobbly pass downfield into a crowd — a play that resulted in a pass interference call against the Lakers and an Irish first down at the Laker 38-yard line. But the luck of the Irish ran out there. First, Johnson threw downfield to Herbert at the goal line, only to see the play broken up by Lake Oswego juniors Thomas Dukart and Joe Hutson. On second down, Johnson lost 2 yards on a scramble, brought down by Laker senior lineman Mike Mercep at the 40. On third down, Johnson threw toward Herbert again, only to see Dukart disrupt the play at the 10. Then, finally, facing fourth-and-12 from the 40-yard line with the clock under 30 seconds, Johnson scrambled right to buy time and threw back across the field to junior tight end Ben Mehlhaff. Mehlhaff, still at the 40, couldn't find an opening and just when he was about to be tackled by LO senior linebacker Gabe DeVille, he pitched the ball backward to a teammate who wasn't there. Carlson picked up the ball at the 48 and rumbled 23 yards before being brought down at the Sheldon 29. "I saw Michael Johnson start to scramble around … and when he cut back, I went with him and saw him pass," Carlson said. "Then, when I saw the ball on the ground … I just picked it up, looked up, tried to see how much time was left and tried to run out the clock. Once I realized I wasn't going to be able to run out the clock, I just got down so we'd be able take a knee and end this game." Laurent did that on the next play — the game's last play — and the Lakers were champions. "I feel like we handled Michael Johnson well," Mercep said. "He had a few good plays — he's going to do that, he's a D1 player — but I think we came out on top for a reason, because we came ready to play." "I knew that it was never over until the last whistle," said Lake Oswego senior running back/linebacker Keenan DeRaeve. "We just love each other and we trust each other. That's really the key for us. It felt amazing." Looking back on a year that saw him sidelined with injury for six weeks, senior running back Collin Bracken said he always knew the Lakers would end up on top. "We're a good bunch of kids and we all love each other so I knew that even if I wasn't playing, that we'd stick together and win as a team," he said. "It felt good." For the game, Filkins rushed 16 times for 90 yards and four TDs, and caught five passes for 77 yards and another score. Bracken added 38 yards on seven carries, Hutson made one catch for 38 yards and Dukart had three grabs for 36 yards. On defense, DeVille finished with 10 tackles, while sophomore Malcolm Williams and senior Brandon Roberts had nine each. For Sheldon, Burgess rushed 18 times for 147 yards and one TD and Herbert made six catches for 109 yards. On defense, Zach Folsom and Parker Wiles had nine tackles each for the Irish, while Zack Folsom made eight stops.